Customs officer details drug find - Patrick C. Fagan, Q.C. Newly issued passports and vague plans led customs officials to be suspicious of a Mexican couple arriving in Calgary, a court heard yesterday. 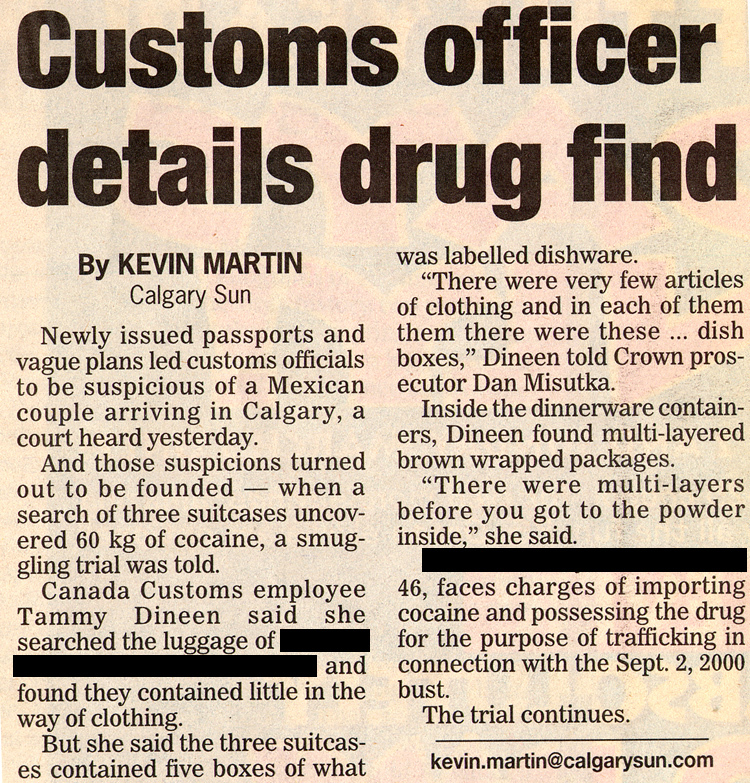 And those suspicions turned out to be founded — when a search of three suitcases uncovered 60kg of cocaine, a smuggling trial was told. A Canada Customs employee said she searched the luggage of the accused and found they contained little in the way of clothing. But she said the three suitcases contained five boxes of what was labelled dishware. “There were very few articles of clothing and in each of them there were these … dish boxes,” the witness told Crown prosecutor Dan Misutka. Inside the dinnerware containers, the witness found multi-layered brown wrapped packages. “There were multi-layers before you got to the powder inside,” she said. The accused, 46, faces charges of importing cocaine and possessing the drug for the purposes of trafficking in connection with the Sept. 2, 2000 bust.